Capatch é um dispositivo plástico descartável e auto-adesivo que funciona por meio do contato direto com o cilindro. O volume dosado do fluido de medição, contido dentro da cápsula auto-adesiva, é pressionado por uma lâmina plástica, denominada “doctor blade”, espalhando-se ao longo da superfície do cilindro. A gota do fluido de medição é forçada para fora da cápsula e pressionada para o interior das células do cilindro anilox. A gota do fluido preenche inicialmente as células mais próximas da cápsula e vai diminuindo em volume ao ser empurrada adiante, até que todo o volume da gota seja completamente absorvido pelas células. O comprimento da trajetória do fluido é inversamente proporcional ao volume atual das células do cilindro. Como o volume da gota do fluido de medição é constante ao longo do Capatch, o comprimento da trajetória mede o volume de tinta, adesivo ou coating cilindro. 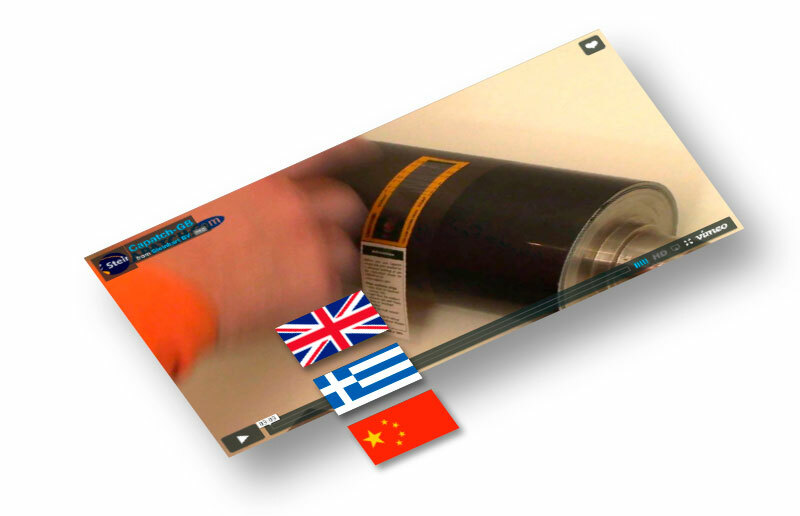 Watch our instruction video to see how Capatch should be used correctly. Para cilindros anilox e rotogravura (revestimento integral). After watching the Instruction Video follow here few simple steps and read the content at each step. Peel off the backing of the Capatch making sure to leave it attached to the Capatch. You will later use this attachment to remove the Capatch from the roll. The blue, green, brown or red squares show where glue patches are located. Place the square at the top of the Capatch against the roll. 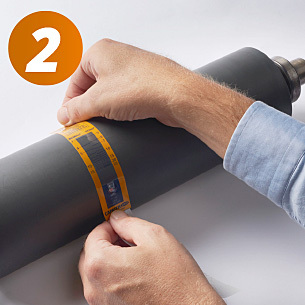 Take the bottom square or the backing and stretch the Capatch downwards and place the bottom square against the roll, ensuring that it is properly attached without any wrinkles in the plastic foil and without trapping air between the foil and the roll. Take the doctor blade and put the index finger on the arrow of the doctor blade. 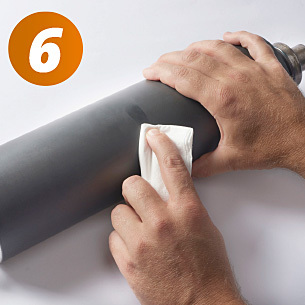 Keep the angle of your doctor blade roughly 45 degrees to the roll at all times while doctoring. Start below the marked arrow on the Capatch, squeeze the indicator fluid from the capsule along the scale printed on the Capatch, moving in a slow tempo but with a firm press from the index finger (not the thumb) on the doctor blade. A slow tempo is needed to allow the indicator fluid to penetrate the cells bit by bit. Repeat this many times until there is no more visible movement of indicator fluid. Then use the left or right side, meaning moving the doctor blade arrow to the left or to the right of the arrow on the capsule, to squeeze the rest of the indicator fluid out of the capsule; this is typically at least 10 percent of the fluid, although it may not be easily visible in the capsule. 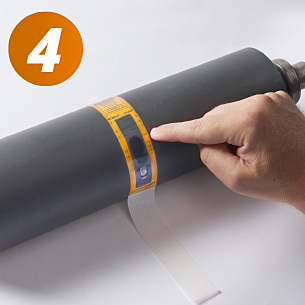 Be aware that a layer of indicator fluid accumulates between the roll and the Capatch foil which is not in the cells, therefore repeat sharp doctoring on the rolls to make sure that ALL the indicator fluid has been pushed from the capsule and between the foil and the roll into the cells of the roll. 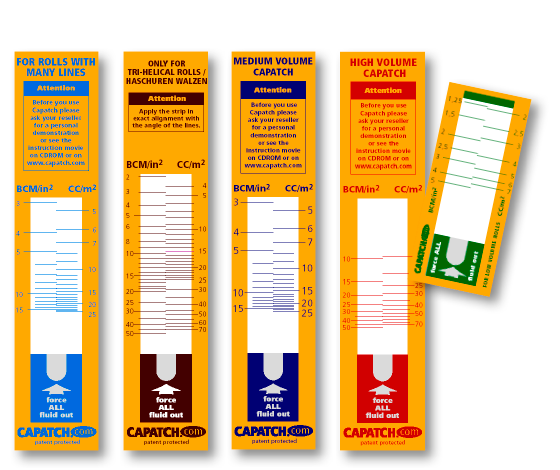 Remember that the Capatch is calibrated on 100% of the indicator fluid leaving the capsule. 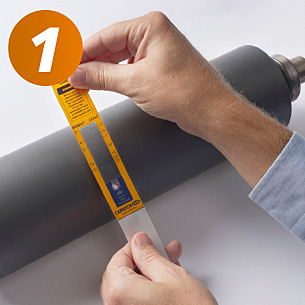 Be aware that there is only a very little drop of indicator fluid in the capsule and if you leave 10 percent of the little drop of indicator fluid behind in the capsule AND you leave 10 percent behind between the foil and the roll, the reading will result in a 20 percent error with the volume 20 percent too large. Read the result. Does the width of the stain have some effect on the volume measurement? Due to the properties of the indicator fluid, the width of the stain has no significant effect on the measurements and on the tolerance of plus or minus 10 percent. Several tests have proven this. The speed of the plastic doctor blade does have effect on the measurement results. Faster blade motion forward causes the stain to elongate somewhat, and less cell volume will be indicated. Immediately remove the Capatch by tugging gently on the backing. Always clean the roll directly after making a measurement. It might occur that you see traces of non-permanent glue on the roll. 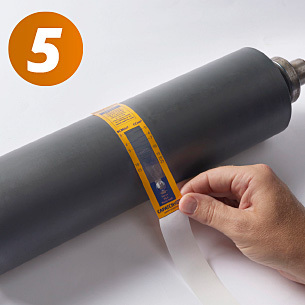 We advise you to use, ethyl acetate, isopropyl alcohol (IPA) or equivalent to clean the roll.